How do life patterns emerge? This is a central question in science and philosophy. To explore this big question, we designed special kinds of games that show global patterns emerging from the interaction between neighboring game pieces. Our games give you two views: a bug's-eye view, a closeup on the parts and how they interact, and a bird's-eye view of the whole pattern emerging on the game board. From the bug’s eye perspective, the games are rules of interaction between neighboring game pieces. Each player can make many choices but they are constrained by these rules. But our board games also show surprising and visually striking global patterns emerging from the interactions. To do well in the games, one must get the big picture and see the emergence of these global patterns. Then, you can use the emergence to your strategic advantage. Our board games with colorful cardboard tiles and game boards, beautiful art, and imaginative settings, make the dynamics very concrete. You experience emergence in a very tangible and tactile way, witnessing game pieces self-organize into patterns. Thus, you learn about self-organizing systems and emergence, very important concepts in all the sciences. The bird’s-eye perspective is seen on the game board and on the computer. 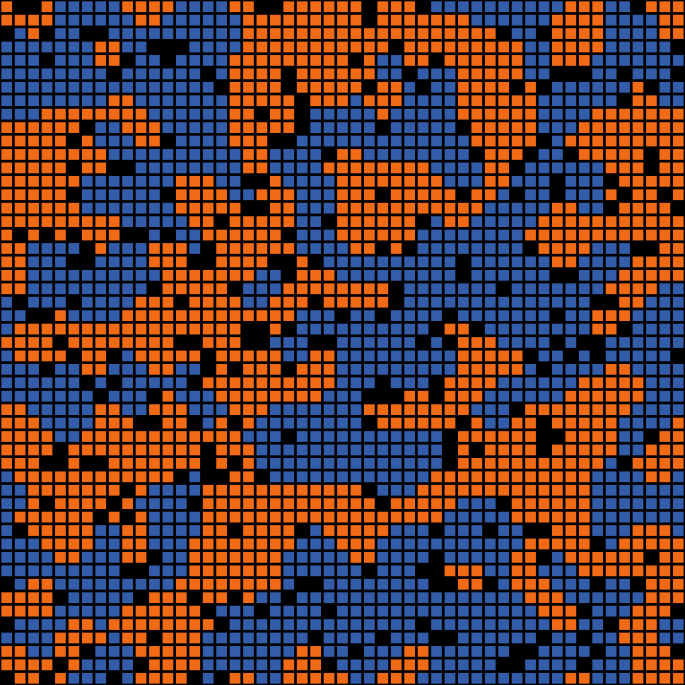 Use our computer models of the games to see large-scale and long-term patterns emerging from simple rules of neighbor interaction. You can use the online computer models to learn more about system modeling and how to code such models. Watch our movies to learn more, and even make your own animated movies using the computer models. Emergent patterns seem to follow rules that are very different from the rules governing the individual parts, for example a flock of birds, the patterns of segregation resulting from interaction of relatively tolerant individuals, oscillations in predator-prey systems, the deep patterns seen across many plants such as the Fibonacci numbers of spirals. In these cases of emergence, one set of rules seems to describe the global patterns, yet the local interaction of parts were governed by a different set of rules. The whole is more than the sum of the parts, or more succinctly and accurately, "more is different" (Anderson 1972). A gas model shows a simple case of “emergence.” At the microscopic view, each particle in a gas has momentum, direction and other properties. If you were microscopic in size, you could measure and record the speed, momentum and direction of each particle. Yet, pressure and temperature are emergent properties only seen at the “macroscopic” level (bird’s-eye view). These emergent properties are not present in the individual parts (bug’s-eye view). Our world teems with emergence. Individual insects only act locally, communicating in very simple ways with neighbors. For example, bees self-organize to pick the best hive site. Ants self-organize optimal foraging paths. Yet, the insects self-organize into global patterns without any centralized planning or a central leader. We see swirling, swarming bacteria, as in Little Tip board game (and code version). Each bird in a flock can only see nearby, neighboring birds. Yet the flock self-organizes, coordinates, turning together, forming beautiful undulating patterns. Something like “birds of a feather flock together" is seen in our board game “Tolerance." (and the computer code version). We see neighborhood segregation emerge even when individuals are relatively tolerant, because even slight preferences for similar neighbors can result in globally surprising patterns of congregation (below left). Similarly, we see lipids in water segregate, resulting in emergence of a neat lining up of lipids into walls (membranes) despite no central plan. This self-organizing or “spontaneous” membrane formation (below right) in water of the right acidity and may well have played a crucial role in the early origin of life. Membrane formation is an example of where pattern emerges from simple rules. The rules are physical, stemming from molecular charges. These rules are simple enough to simulate in a computer model. Consider that the membranes can act as little bag containers that can hold chemicals in high enough concentration for vital life reactions to occur and function in energy storage (as we discuss under energy patterns). An implication is that simple physical rules play an important role in the emergence of life.